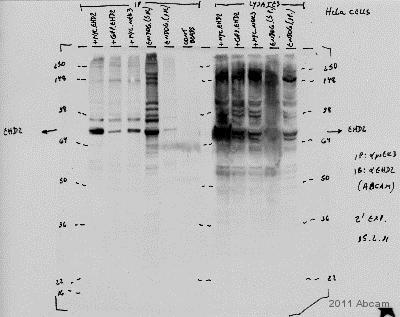 This antibody is expected to recognise EHD1 protein as well as EHD2. , corresponding to C terminal amino acids 529 - 542 of Human EHD2. Human heart lysate. Lysate prepared from transfected HEK293 transiently expressing EHD2. IF/ICC: A549 cell line. Purified by ammonium sulphate precipitation followed by antigen affinity chromatography using the immunizing peptide. Our Abpromise guarantee covers the use of ab23935 in the following tested applications. WB Use a concentration of 0.003 - 0.01 µg/ml. Detects a band of approximately 60 kDa (predicted molecular weight: 61 kDa). Anti-EHD2 antibody (ab23935) at 0.003 µg/ml + Human Heart lysate (RIPA buffer, 35µg total protein per lane). Publishing research using ab23935? Please let us know so that we can cite the reference in this datasheet. Does this work for the hamster cell line? We have not tested this antibody with hamster, only human and mouse. The immunogen used to raise this antibody is RLVPPSKRRHKGSA and is 100% homologous with Chinese Hamster EDH1 (note that this antibody should recognize both EDH1 and EDH2). Therefore, we would expect this antibody to cross-react with Chinese Hamster, but we couldn't guarantee it as this hasn't been tested.